I’ve recently tried out Tails as a bug tracking tool. I like it and I’d recommend you check it out if you’re looking for a straightforward bug-tracking tool without a lot of extra bells and whistles. This is a quick review of what I have found to be the best defect tracking tool for my purposes. When someone recommends something to you (whether a movie, a car, or a software application), it is useful to have an understanding of where they’re coming from; when ordering from Netflix will they be drawn to the gritty genius of “the Usual Suspects” or an animated Disney classic like Fantasia? Is their idea of the perfect car a 36 HP 1959 Karmann Ghia convertible or a 2009 Humvee? With that said, here’s where I’m coming from with respect to software applications. I’ve always appreciated nice, simple, cleanly-designed software applications that work as you’d like them to without requiring you to invest time searching help files or in training. My appreciation for clean, straightforward applications has increased in the last year as I’ve had more hands-on Product Management responsibilities at Hexawise and I’ve seen first hand how hard it can sometimes be to strike the right balance between (1) the goals of elegance and simplicity on the one hand and (2) a Product Manager’s natural desire to equip the application with additional features and functionality on the other hand. The screen capture tool Skitch has done a superb job of achieving this balancing act, as described well in Sean Johnson’s article, in which he writes: “These days it takes more than being an adequate solution to a real problem that people have and are willing to pay to solve. That’s certainly required, but it’s just not enough. You have to create happiness and joy in your users and they must love your product.” Unfortunately, Skitch is only available to Mac users for now. Similarly, Seth Godin and the gang at 37 Signals have done an excellent job at putting together simple, clean, powerful applications like Basecamp and Highrise. I strongly recommend their blog, Signal vs. Noise, about “design, business, experience, simplicity, culture and more” and their book “Getting Real“. 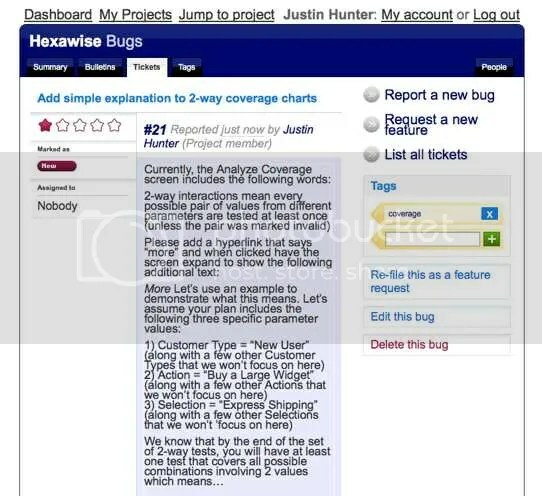 I’ve been heavily influenced by the designers of those tools when making Product Management and Design decisions about our test design tool Hexawise. Enough preamble. 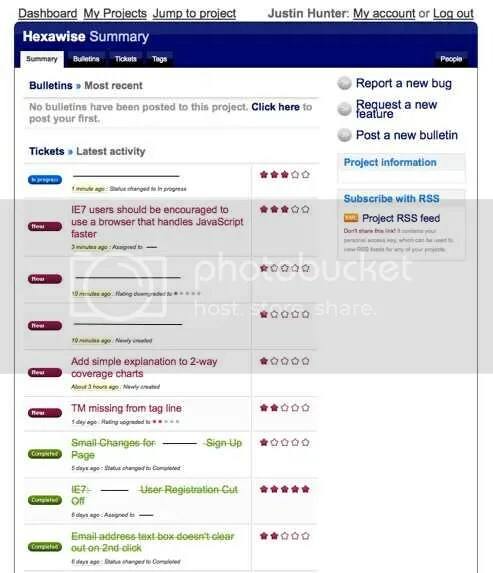 My point is, if you appreciate the similar design philosophies behind Skitch, Highrise, Basecamp, and Hexawise, which place a premium on nice, clean, intuitive design (and explicitly try to avoid “feature bloat”), I suspect you’ll like Tails as a bug-tracking tool and enjoy using it. By design, Tails doesn’t have a lot of bells and whistles. It does such a good job at the features the vast majority majority of users need, that it is a joy to use. I’ve attached a couple screen shots below (with a few redactions to protect client confidentiality, etc. ).